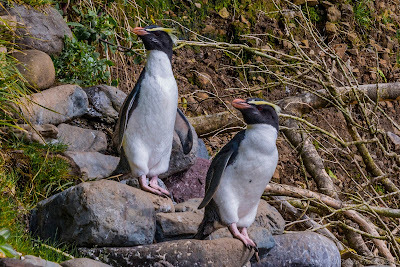 New Zealand Nuggets: Fiordland Crested Penguins! ~ Learn, Live, and Explore! 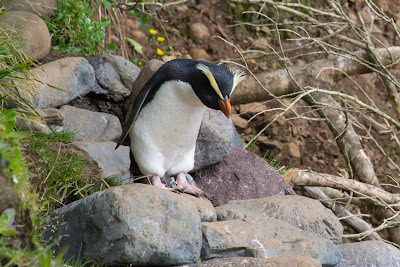 Besides what I already had planned in Queenstown this past October, there was absolutely one thing I wanted to see no matter what while on New Zealand's south island. 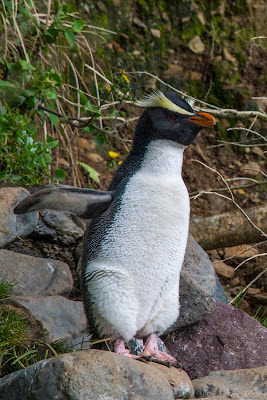 Once I saw a photo of the adorable yellow eyebrows of the Fiordland Crested Penguin, or Tawaki in Maori, I was sold on this little flightless sea bird. 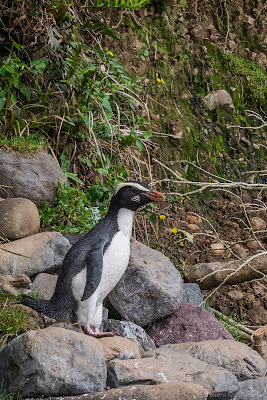 There are other penguins on the south island, like the blue penguins on the east coast near Omaru, but the Fiordland Crested are notoriously hard to find and skittish when found, so a solid spotting session, when it happens, is enjoyed by all! While the Fiordland Crested Penguin, the second rarest breed of penguin in the world, can be found in and around New Zealand, South Australia, and Tasmania, it exclusively breeds on the south island of New Zealand. The breeding grounds are primarily on the west coast, but some of the larger known areas are being threatened more and more by New Zealand's growing ground pest issue, as stoats and weasels are getting to their nests and eating the eggs. Finding the nesting grounds can be tricky because they are often hidden off the beaches in the coastal forests, under tree roots or in scrub bushes sometimes hundreds of meters inland. 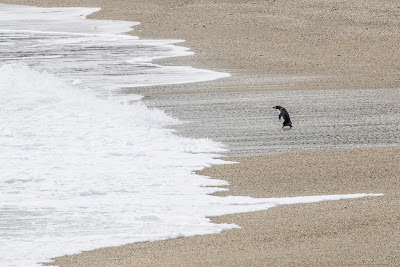 And the fishing pattern of the adult penguins is all day, in and out, instead of the more predicable dawn out/dusk return pattern of the blue penguin. 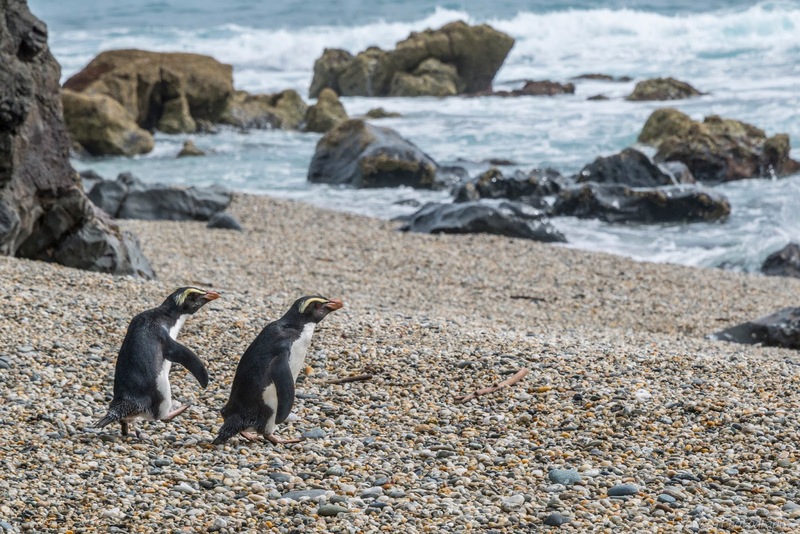 Their timid nature with humans also doesn't help when it comes to finding a colony and observing them over a period of time. When we were photographing these penguins, we were semi-hidden behind rocks and I was using a focal distance of 200-300mm on my zoom lens. It also took about 45 minutes before we saw our first penguin pop out of the forest. 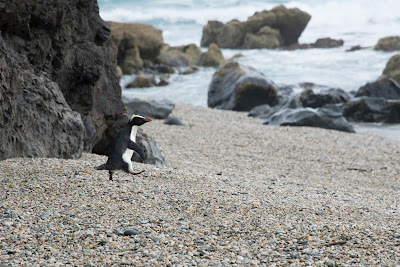 Over a 2-3 hour period, we were lucky to see over 15 penguins either coming in or going out. Supposedly, the daily average is higher in November as the baby birds grow older and more demanding of food. I mentioned "we" before, and that is because I was with a special guided small group tour. 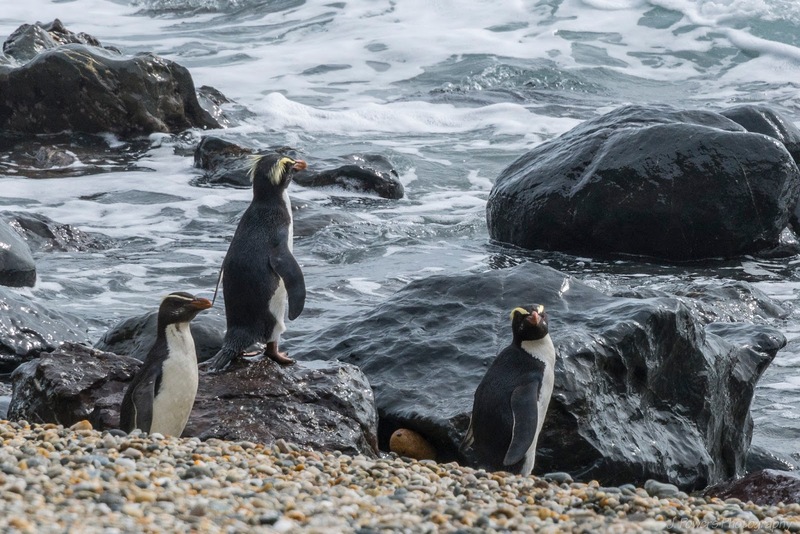 Since seeing these penguins was a goal, I knew I was maybe going to have to go to extra monetary lengths to find them. I had the timing correct, since October and November are the best viewing times, but I still needed a location. 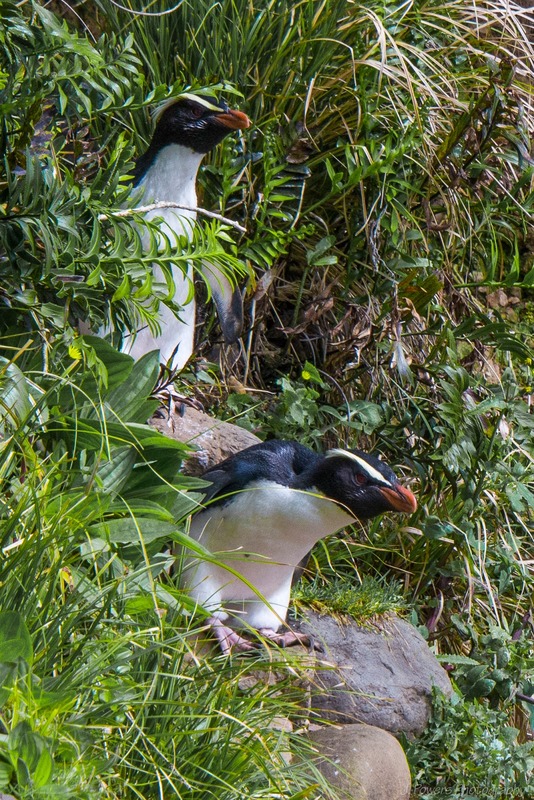 What I ended up doing was staying at the Wilderness Lodge at Lake Moeraki just north of Haast. 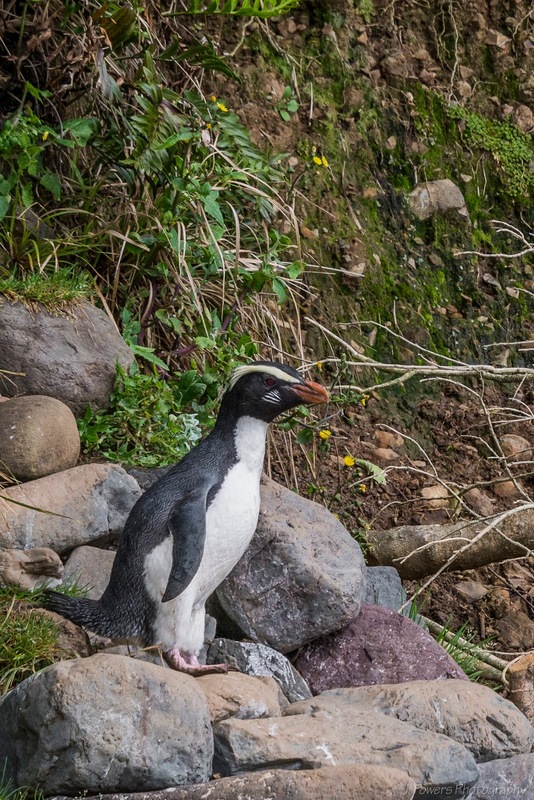 The couple that runs the lodge are avid wildlife conservationists and keep a keen eye on the annual populations and breeding patterns of the local penguin colonies. They also maintain the area on a beach that is favored by the breeding penguins to ensure safe passage from the nests to the ocean and encourage the penguins to return the following years. They lead small tours to this beach for an additional fee, which I was more than willing to pay. There are also other group nature walking tours from the Lodge that are free during your stay, and I had a lot of fun learning new things on those too - especially the glow worm evening tour where we not only saw a huge colony of glow worms that looked like Christmas twinkle lights but the skies gave us a show that included the Southern Cross and Magellanic Clouds, or two dwarf galaxies only visible in the Southern Hemisphere. Oh, and one more comment on the lodge - the food was good! So, it took a little - no a lot - of effort, but I think it was all worth it. The drive to Haast is about 4 hours from Queenstown through the aptly named Haast Mountain Pass. There are beautiful views along the way, though, and stop to walk to the Blue Pools and several waterfalls if those interest you - maybe hit some on the way out and some on the way back. If you are driving from Queenstown, I recommend taking the road through Cardrona into Wanaka at least one way. There is a famous lone willow tree in Lake Wanaka that you can visit. Wanaka also has a cute downtown area. A long way to drive, a little pricy to stay, but those bushy eyebrows are worth every penny and every minute behind the wheel!